Boy, do we need a legendary live album that is so hated by its main performer that he pretends it doesn’t exist. 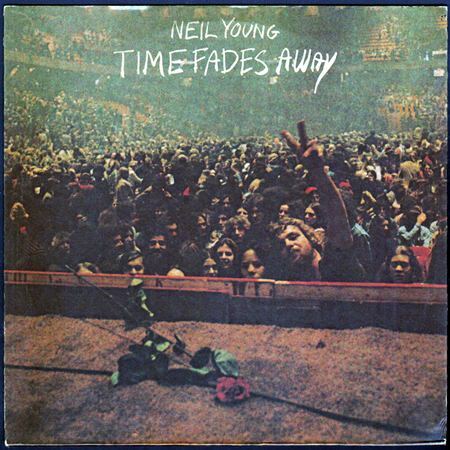 The “Time Fades Away” tour in 1973 is living proof of Neil Young’s eccentricities; the star of mega success “Harvest” dismantling himself right in front of thousands of fans, and then millions as seven takes from that disastrous tour were assembled and released as an eight-track album (the eighth track lifted from a 1971-concert). Neil Young was a superstar at that moment in time, hot on the heels of “Harvest” and being the main attraction of Crosby, Stills, Nash & Young. But he would have none of it. Late in ’72 came the soundtrack-double “Journey Through The Past” containing just one new song and little else worth a listen. Then he took The Stray Gators with him across the U.S. on a 62 date tour. They were all in a bad shape, there were bad vibes, cases of tequila, quarelling about money, and in the midst of it all a very unpredictable and unstable Young who took it out on them all, keeping the whole entourage on its toes, postponing sound checks, lambasting the band members, the works. His guitar playing would be below par too as his faithful old Gibson Les Paul was broken, so he replaced it with a less reliable Gibson Flying V that kept going out of tune. The audience was in for a hard time obviously and not at all prepared for the band’s raucous and highly electric treatment of Young’s best loved tunes, including the key tracks from “Harvest”. What made it even worse was the generous insertment of new songs that had nothing in common with the cuddly mood of “Heart Of Gold”. Not in spite of, but because of this artistic left turn, “Time Fades Away” is a great and fascinating album. It contains no old music at all. Every single one of the eight tunes were new to those who bought the record. Neil Young tested his audience as much as he tested himself. In all its ramshackle shabbiness the album delivers a different kind of beauty, there’s loads of integrity involved, it is a semi-documentary capturing something falling apart, but there is no sadness involved, because it has to fall apart, this is the sound of Neil Young reinventing himself and preparing both him and us for the naked, horror-stricken and extremely powerful albums that were to follow: “On The Beach” and “Tonight’s The Night”. And the lesser, but still great “Hawks And Doves” and “American Stars’n Bars”. In retrospect, most of the songs on “Time Fades Away” work surprisingly well. The stomping, almost flat footed title track is a delight; the long and not very elegant “Last Dance” grows on you, as do “Yonder Stands The Sinner” and “Don’t Be Denied”, though I do admit that they are not Young’s most accessible recordings. “LA” is doomsday dressed up almost pretty, the apocalyptic words about the coming earth quake are pure poetry, a slow song locked in that typical lazy “Harvest”-backbeat. And there’s the vulnerable and haunting beauty of the piano-ballads “Journey Through The Past”, “The Bridge” and “Love In Mind” (the latter lifted from a 1971-concert) – all three are as magic as anything on “After The Goldrush”. Not a bad album at all. It has become my all-time favourite Neil Young live-experience, and it sure deserves a re-release. Johnny Barbata — drums on “Time Fades Away,” “Yonder Stands the Sinner,” “L.A.,” “Don’t Be Denied,” and “Last Dance”.